Carey sophomore Nate Adamson takes the ball to the basket during Tuesday’s road game against the reigning State 1A Division 1 champion Glenns Ferry Pilots. Season-opening games haven’t been happy occasions for the Wood River High School boys’ varsity basketball team in recent years. Wolverine teams hadn’t earned a season-opening win since way back in 1999 and had dropped their last 12 debuts by an average score of 18.6 ppg. Nevertheless Wednesday’s bus trip home from Kimberly was a very happy one for the Wolverine varsity of first-year coach Andy Miles. Wood River (1-0) clamped down on defense and got scoring from nine different players in a 35-24 non-conference triumph over the Kimberly Bulldogs on the Kimberly floor. Sophomore Cody Carter (8 points) and freshman Alec Nordsieck (6 points, 4 assists) led the way for a young Wood River hoops squad that built a 21-13 halftime lead with a 15-5 second-quarter outburst. Wood River teams had only won a single road game over the last two seasons, that coming last Jan. 4 by 20 points at the Community School. But coach Miles brought his squad into a tough gym and prevailed. Going into the third quarter with an eight-point lead, Wood River’s defense held Kimberly to just two points in the third and then slowed it down on offense. Carter snuck into the lane a couple of times after half and took passes from junior Kevin Hernandez (6 points, 5 rebounds) for key baskets. Other contributors included Eron Bates (5 points, 6 rebounds) plus 2 points apiece by Max Mauldin, Connor Hayes, Jonathon Scott, Finn Isaacson and Nickolaus Brunker. Wood River hosts the Filer Wildcats (1-0) today, Friday on the Hailey hardwoods and welcomes Gooding Tuesday, Dec. 4 for another 7:30 p.m. home game. Filer won a nailbiter at Burley 44-43 Wednesday. The Wolverines last won a season opener Dec. 2, 1999 by a 71-54 score over visiting Glenns Ferry with James Cordes (20 points) and Sky Wolfe (17) leading the way for the 8-15 squad. The Glenns Ferry Pilots lost plenty of stars off their State 1A Division 1 championship team of last March. Key players Adrian Martinez, Chris Popoca and Wilder Jones graduated. But the Pilots (20-7 last season, first state title since 1981) still have some gas left in the tank especially with the shooting of 5-10 junior Ruben Juarez. 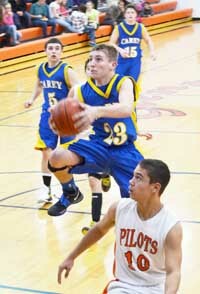 He scored 21 points in Tuesday’s 49-31 Pilot home victory over the Carey School boys. Leading Carey (0-1) were Sheldon Hansen (12 points, two 3-pointers), Jordan Dilworth (6 points), Nate Adamson (5), Poncho Gamino (4), Gunner Thompson (2) and Patrick Baird (2). The Pilots (2-0) ended up with seven 3-pointers. Carey hosts Hagerman’s boys today, Friday at 7:30 p.m. in the Panther home debut, the 1A Division 2 Pirates 0-1) coming in from their 54-53 loss at Castleford Tuesday. Carey visits 2A Valley on Thursday.